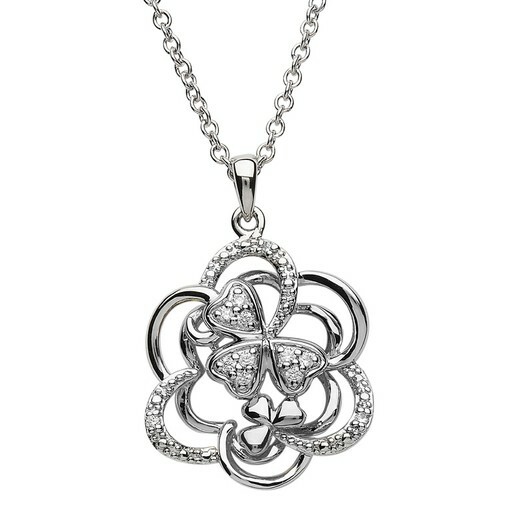 Graceful movement and Celtic tradition are captured in this unique pendant. 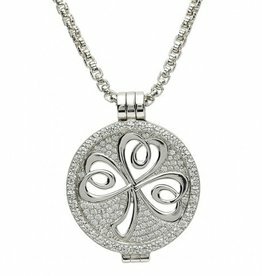 Two shamrock figures are featured, one in solid sterling silver and one encrusted with white crystals, intertwined in sterling silver and white crystal encrusted Celtic twists. 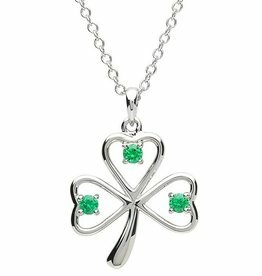 The shamrock is a traditionally recognized symbol that is said to bring good luck & wellness. The playful energy of this piece is sure to stand out! 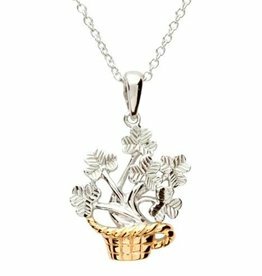 The pendant measure 1 1/8" (including bale) and comes with an 18” sterling silver chain. 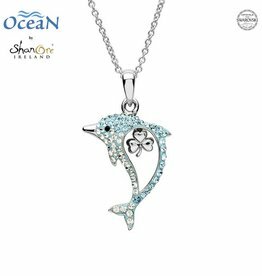 Made in Ireland by Shanore Celtic Jewelry. 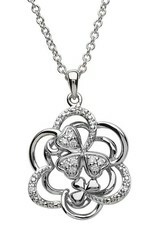 Celtic Expressions-- Sterling Silver Medallion Pendant with interchangeable Celtic Coins! Chain, Holder, and Coins sold separately! 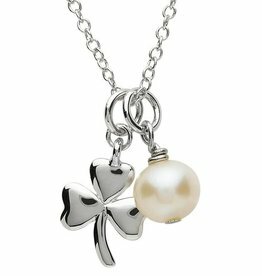 This unique double pendant necklace pairs a little platinum plated shamrock with a white pearl. It measures approx. 7/8 inch (including bale) by 1/2 inch. They hang from an 18” platinum plated chain. Item comes boxed. Look for matching earrings. 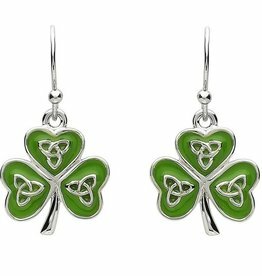 These shamrock earrings, with trinity knots combine the elegance of platinum and enamel. They measures approx. 3/4 inch by 1/2 inch each. They dangle from platinum plated ear hooks. Item comes boxed. Look for matching pendant.